This is how SMC cleaning services accomplishes residential gutter cleaning in Houston,Tx. For professional residential gutter cleaning in Houston,Tx call SMC cleaning services at 281 899-0402 for all your gutter cleaning needs. First, you need to have the proper equipment and tools to do the job right. We use extension ladders from 24 feet in length to 36 feet in length. Also, we use extension poles with a good soft bristle chemical brushes for hand scrubbing the gutters. We put rubber guards to cover the end of the ladder, so we don't scratch the gutters. The chemical we use is a special gutter cleaning chemical made specially for gutter cleaning and it is environmentally friendly. The pressure washers we use on all our rigs are 4gpm @ 4000 psi. We have an extension that connects to the wand on the pressure washer to extend it from 6 feet all the way to 24 feet for those higher gutters. It is always safer to do all gutter cleaning in Houston, Tx from the ground with an extension wand if possible. We start gutter cleaning your home in Houston Tx by first choosing the proper length ladder for the job. We make sure to check for any overhead obstructions like power lines or over hanging limbs. Always make sure the ladder is level before climbing and use the proper climbing angle. Before applying the chemical, always wet down all plants by applying water on them. At SMC Cleaning Services, all chemicals we use is environmentally friendly. When applying the chemical, we run the chemical directly through the chemical injector and soap about a 10 ft section. Always test a small area first to make sure the chemical won't remove the paint. If the gutters have been repainted, the chemical can remove the paint so always test a small area first. 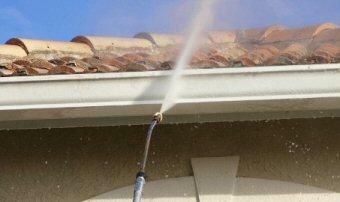 Soap the area with the gutter cleaning chemical, then pressure wash the black streaks off the gutters. If the streaks are really heavy, use the extension pole and brush to scrub the gutters clean by hand. So, for professional residential gutter cleaning in Houston,Tx call SMC cleaning services at 281 899-0402. You can also fill out the form below for a free quote. Call Today!